Special Premiered on MSNBC on August 12, 2018. The next episode will air in Spring 2019. There are more than 1,600 extremist groups operating in the United States right now. While the number of these hate groups seems staggering, recent data actually points to a decline in membership. But that is not the whole story. A drop in membership means two things: it has made the remaining active members even more essential to these established hate groups, causing the leaders of each chapter to intensify their deathly grip on members, making it nearly impossible to leave—even if they wanted to. More importantly, it means that that the Internet and social media have made it impossible to measure more mainstream fringe adherence to these same extremist ideologies that are spreading like wildfire from the lips of demagogues and across the web, and infecting an already volatile American fabric. After years of brainwashing and indoctrination, it can be terrifying to face the world without a shield of hate or prejudice. The current American racial climate is at an all-time boiling point. “Injustice” on the lips of every American—for good or for bad. The lure of a hate group begins as a siren song and then becomes so suffocating, that having a “change of heart” is simply not a viable option. Being caught even considering an exit could mean violent consequences for you or your family. What do you do when you realize that everything you've stood for is wrong? That what you believe is actively harming you, your family, and society as a whole, not saving it like you were told it would? How do you leave hatred behind when your entire life might be wrapped up inside of it? 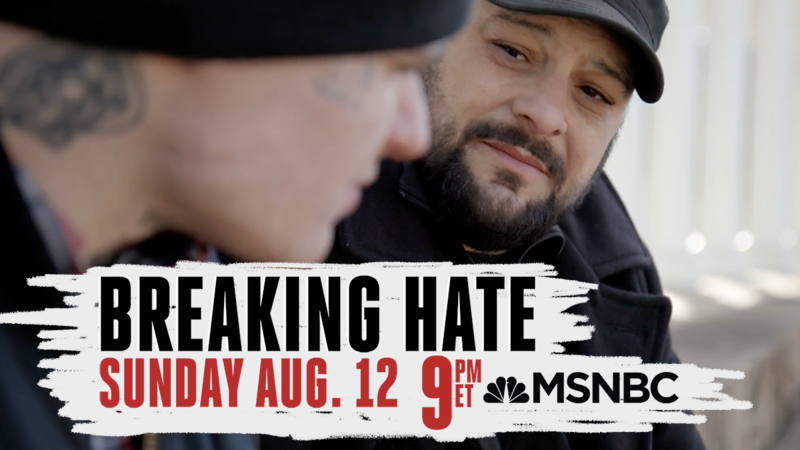 One year after the riots in Charlottesville, Virginia, MSNBC presented Breaking Hate, a special produced by Part2 Pictures following reformed neo-Nazi skinhead Christian Picciolini as he tries to atone for his past while taking on hatred in America. The hour-long episode premiered August 12, 2018 on MSNBC. The second episode is forthcoming. Breaking Hate follows Picciolini, a former skinhead who uses his own personal journey to help others escape the movement he once helped build. In the first episode, Picciolini brings together a former white supremacist who participated in the Charlottesville riots with the mother of Heather Heyer, the counter protestor killed by the car that drove into the Charlottesville crowd on August 12, 2017. Together, they begin a larger conversation on the issues dividing the country today and discuss how to start healing the wounds left behind by tragic events such as Charlottesville. “Breaking Hate” is produced by Part2 Pictures. Executive producers include Amy Bucher and David Shadrack Smith.